In this article, we show you how to write an article critique. The same rules apply for how to critique a journal article and how to critique a research article. The structure and layout of your article critique are easy, it is the actual critique content that is tricky. You have to find a way of determining what is good and what is bad, all while ensuring you understand what was written intentionally by the writer, and what is a glaring mistake. You may point out how the writer missed the point of the research data, or maybe misinterpreted the research data. Ideally, you need to keep your bias out of the paper, but you will be adding your own opinion at some point, so your job is to make sure your bias is as balanced as possible. Your professor or education institution will specify what comes first. Most will ask for a title page and explain what needs to be featured on it. Some may want a contents page, abstract, and so forth. Your college will have its own rules on settings, layout, format, style, and how you must submit your work. You will need to list the name of the authors, and you will need to enter the title of the article. 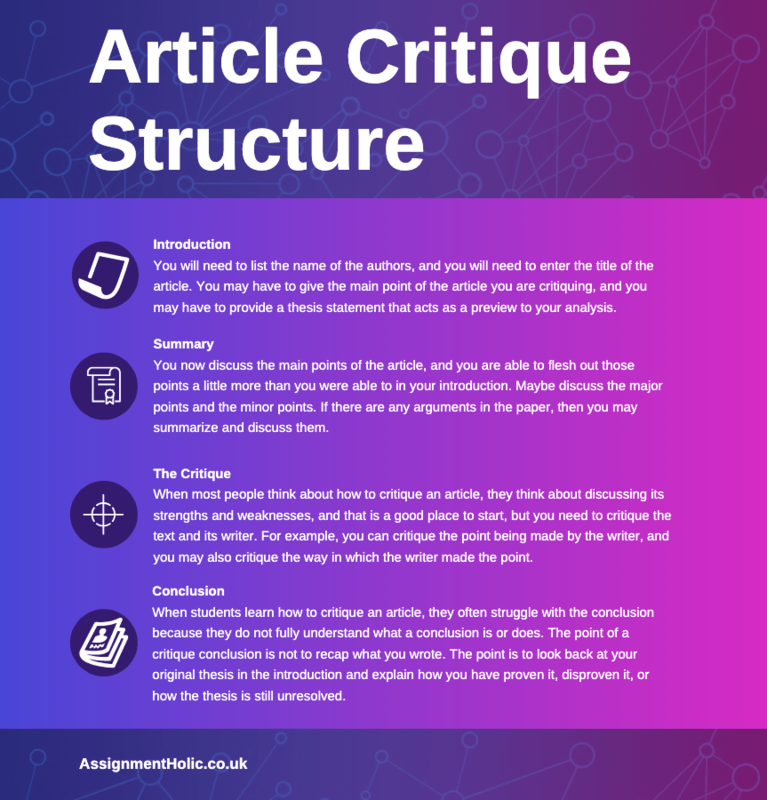 You may have to give the main point of the article you are critiquing, and you may have to provide a thesis statement that acts as a preview to your analysis. If you are figuring out how to critique a research article, the main point of the paper is usually written in its title and in its thesis statement. For example, if it is called, “The movement of snails in urban areas,” then that alone will require only a slight amount of elaboration when you write your introduction. For example, you may elaborate and explain where the evidence was gathered and in which time frame and time period it was gathered. In keeping with the snail example, your thesis may be that the paper is too short-sighted because it draws its conclusions from limited studies and the studies didn’t account for changes in seasonal weather. You now discuss the main points of the article, and you are able to flesh out those points a little more than you were able to in your introduction. Maybe discuss the major points and the minor points. If there are any arguments in the paper, then you may summarize and discuss them. You should also summarize and discuss the findings in the article. Remember that you are not critiquing them or judging them at this point, you are merely pointing them out for the benefit of the reader. As a side note, if you are in full-time education, then you are also showing your professor that you understood and recognized the points made in the article. It also shows the depth at which you understood the text. For example, in the movie “Maleficent,” most movie critics explain how the protagonist lost her wings, became ugly, and was shunned and considered evil. However, those who understood the movie on a deeper level could link her losing her wings with a woman losing her breast after a cancer scare, and how she feels ugly and shunned in the same way as Maleficent. The summary is a good place to show your professor that you understood the text on every level. When most people think about how to critique an article, they think about discussing its strengths and weaknesses, and that is a good place to start, but you need to critique the text and its writer. For example, you can critique the point being made by the writer, and you may also critique the way in which the writer made the point. For example, the professionals at the Assignment Writing Service UK know how to critique a journal article and its author. A writer may have made a point in a research paper about how the data shows that immunizations do not cause autism but may also point out that the writer never really examined the original text and is relying too heavily on the refuting evidence rather than concentrating on the weakness of the original text. The writers at the AssignmentHolic Service know how to get under the skin of an issue in order to pull out points that most students are not experienced enough to notice. You are allowed to give your opinions, but they need to be clear and finite. Try to back them with evidence, even though it can be tough to find reliable evidence and try to back up your opinions with examples. For example, if you say that the writing is childlike in nature, then cite a few passages that you consider childlike and explain why you think they are childlike. When students learn how to critique an article, they often struggle with the conclusion because they do not fully understand what a conclusion is or does. The point of a critique conclusion is not to recap what you wrote. The point is to look back at your original thesis in the introduction and explain how you have proven it, disproven it, or how the thesis is still unresolved. You may summarize the key points you made, but only in an effort to prove or disprove your thesis. Close your critique with a statement about the research that is still needed in the field, and maybe a comment about the significance of the research.